Sync for Fitbit downloads your Fitbit history from Fitbit.com and stores it on your iPhone in Apple’s Health App. After syncing your data manually for the first time the app will auto-sync your data in the background multiple times a day automatically. HGarrison75 - "This app is awesome! I have an Apple Watch but I love the Fitbit! Finally, an app that puts all my data in the iPhone Apple Health App and does it correctly AND automatically! 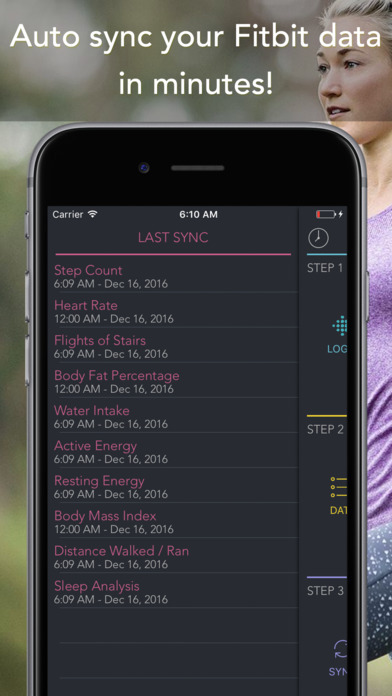 Thank you"
SheilaB73 - "This is the Best app to Sync your Fitbit data to Apple’s Health App and it works perfectly. Auto sync feature works in the background without need for manual syncing from time to time. This is the best sync app I ever used. Great Buy!" Please do not post issues with the app as a review. Report issues to support@cloforce.com so we can help you resolve them together. We have resolved every issue that has been reported. Syncing your Fitbit data with your iPhone allows you to use the Apple’s Health App to view your Fitbit data and any other fitness or medical data in one convenient app. Fitbit Aria scale data will also be added to Apple Health when you sync. Sync for Fitbit syncs up to 12 fields. You can customize the app to only sync the fields you want. - Background auto sync. Run the app in the background for all day auto sync when new data is available from your Fitbit! NOTE: Fitbit restricts access to intra-day heart rate data. We are working very hard to gain access to this. Step by step instructions on how to use the app can be found in the app, but if you have any questions you can always contact us at support@cloforce.com and we’ll be happy to help you! To remove all your Fitbit data from Apple Health and re-sync - delete our app, install it again from the App Store, launch the app and Sync again. Data is synced using 3 easy steps after you have synced your data using the Fitbit app. 1. In the Sync for Fitbit app, sign into Fitbit.com using your account credentials. 2. 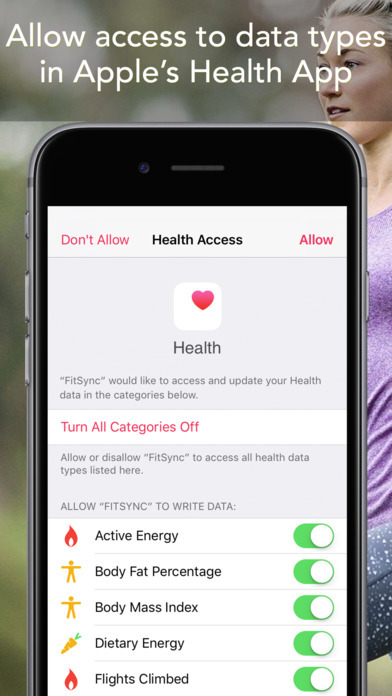 Select the fitness fields (steps, sleep, etc..) you want to sync with Apple’s Health App. 3. Click the “Sync Now” button to start syncing your Fitbit data with Apple’s Health App. After the first sync your data will auto-sync in the background multiple times a day!! To avoid seeing duplicate activity data in the Apple Health app disable fitness tracking on your iPhone. Go to Settings->Privacy->Motion & Fitness and disable "Fitness Tracking". Your first sync could take up to a minute or so depending on how much data you have with Fitbit.com. After your first sync, all manual and background syncs will only take seconds.